We all know the importance of getting enough protein and eating low calorie healthy options. However it can be hard when you feel like eating something sweet as a snack or for dessert. That is where using your whey protein powder along with lower calorie options is a good choice. 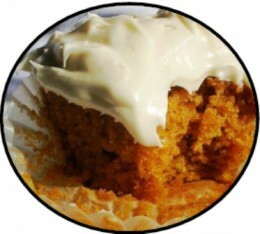 This protein pumpkin cupcakes with protein frosted icing on top may be just what you have been looking for. Blend all the ingredients together. It is best to use electric mixer or hand mixer if possible. Ensure it is well mixed. Place the mixture into the 12 cup muffin tin liners you prepared earlier. Divide mixture evenly as possible into the cups. Hope you enjoy eating them and remember not to eat them all up at once. For more recipes or articles click here!